Oklahoma small businessman Willie Rosseett was recently stunned when he learned that Discover Financial Services Inc. (DFS) had canceled his credit card. "We have never been late and always paid them more than the minimum," said Rosseett, who owns ARDCO, a maker of circuit boards. "There is nothing I can do. I feel very helpless." Rosseett, whose case is being reviewed by Discover, said he is current on his credit card bills. He's not the only one in a bind. Anecdotes about credit card companies cutting credit card limits even for prime borrowers have abounded in the media. The situation is causing a serious problem for companies across the nation. That's because credit cards are a common way for small businesses to fund themselves.A Discover spokesman declined to comment about Rosseett, citing privacy concerns. The businessman said his company is successful. For its part, the government has tried to address the credit problem. In May, President Obama signed sweeping legislation that restricted credit card interest rates and fees. After the bill was passed, American Bankers Association President Ed Yingling told Reuters that credit cards were going to be longer-term instead of short-term loans. The credit card could lose $15 billion in penalty fees, according to government estimates. But the problems with credit go further. Thanks to the recession and rising unemployment brought about by last year' s collapse of Lehman Brothers Holdings, everyone is a little less credit worthy. 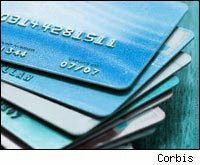 People are seeing their credit lines lowered, or in some cases terminated, by banks eager to reduce their risks. Business owners are also finding it difficult to get access for credit. According to the Federal Reserve, financial institutions had $905 billion in revolving credit available in July, down about $70 billion from the third quarter of 2008, when the financial crisis began. Banking analyst Meredith Whitney estimated late last year that the U.S. credit card industry would pull back $2 trillion in available credit lines in 2009 and 2010. Discover has cut back credit lines on accounts that were not active. Visa Inc. (V) , MasterCard Inc. (MA) and American Express Corp. (AXP) have all reportedly done the same thing. Officials from the companies could not be reached for comment. When credit availability is reduced, the ramifications have been far-reaching. The move can hurt a consumer's credit score by making them appear to be strapped for cash. It also removes a financial cushion that people rely on when times get tough. Credit counselors have ringside seats to see how abstract concepts such as "credit crunch" play out in the real lives of consumers, and often it is not a pleasant sight. They often find themselves to be the bearer of unpleasant news. Among some of the bummers? Having to tell consumers their dream house will never be affordable. Demand for credit counseling services continues to be strong, even as the economy shows some signs of improvement. "We're in uncharted waters here," said Gail Cunningnham, a spokeswoman for National Foundation for Credit Counseling. She has seen nothing like the current crisis in her 23 years in the business. Member agencies helped 3.2 million Americans in 2008, more than double the amount two years ago. The Consumer Counseling Service of Greater Dallas is a case in point. Counseling sessions rose 40 percent in 2007, when lots of people got caught up in collapse of the subprime mortgage market. Demand for housing counseling is up 294 percent, according to Todd Mark, the organization's director of education. Now, the people seeking the group's assistance are prime borrowers. "The recession has caught up with those folks," Mark said. The after-effects of the Lehman failure are still being felt as unemployment climbs toward double digits. Median household income dropped to $50,303, in 2008, down 3.6 percent from 2007, the biggest year-to-year drop in 40 years. Mark and his colleagues should have no shortage of work to do.